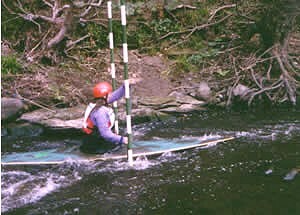 The Oughtibridge Slalom Site is on the River Don in South Yorkshire, about five miles north of Sheffield City Centre. It is a private site managed by Sheffield Canoe Club. 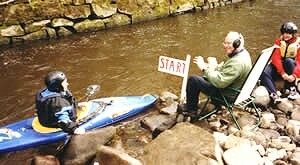 Directions and further information are available via Sheffield Canoe Club Website at http://www.sheffieldcanoeclub.co.uk or from the River Don officer. 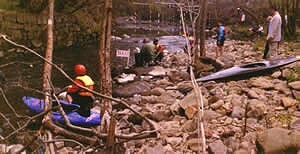 The Oughtibridge Slalom is a Division 3/4 weekend event held twice yearly, and attracts a good number of participants. The relatively narrow, rocky and shallow river is easy Grade 2 water at this location. Reservoir fed, the river maintains a steady but low flow rate through the summer months. Sheffield Canoe Club has done some work on the river bed to keep the Slalom Course navigable. Gates are placed on flat water, in quiet pools, near eddies and across faster water sections, with small waves providing for excitement and the odd, infrequent spill. The site makes a good competition for beginners and intermediates alike. The neighbouring grassed area, off the sports ground, offers good camping but also provides access along the whole length of the river bank for stewarding, safety, spectators and non-paddling coaches and instructors to see and encourage paddlers. There is a surfaced car park area on site, catering facilities, showers, changing areas and heated indoor shelter available in the Clubhouse.